Another day, another class. This was the V&A handbag course part two so this must be Wednesday, right? I am exhausted but I did have a great time. Nice students, excellent work produced. It’s so satisfying to run a happy and productive class. I’ll post some pictures of their work tomorrow. I can’t be bothered to go to the other end of the flat (such a long way, ha ha) to get my camera. I picked up these threads in a big bag bundle at the junk shop earlier in the week. 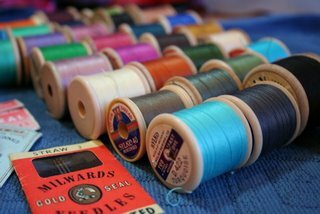 I went for buttons and came home with thread… I use so much thread that whenever I see cheap spools I pick them up, as long as they aren’t all brown and grey! Some of these are old, but some are new, most of them are colours I will easily use, and indeed have already. They weren’t that cheap – this bag was £10 (over $20) but I would have spent more than that to buy this much new. And of course I got some pretty vintage needles and things. I got a delivery of my new labels today. 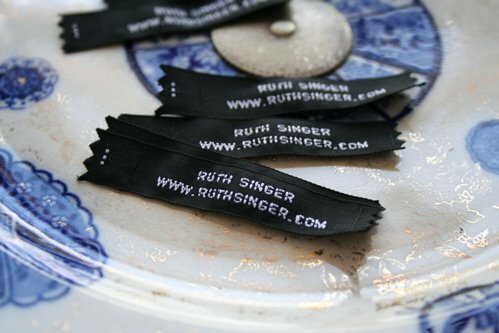 These are a stop-gap until I have proper ones either woven or printed with my logo and name (like on my website)and I am not convinced I like them, so will get on with ordering proper ones quickly! They are very stark and minimalist for me. But they are growing on me. I might get to like the simplicity. I don’t like the font or the use of capital letters, but this was the best option for quick, cheap and easy labels. 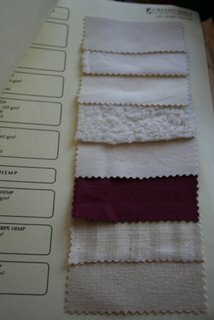 I also got my first batch of organic fabric samples. I’m going to have to try some yardage and see what works. There is some nice percale which has the stiffness I need for all the pleated and gathered stuff, plus some lovely indigo linen and black linen. I’m disappointed that there isn’t any better silk but I am hoping to get hold of the hemp/silk mix I used to get locally and try that out. I totally understand – I have a pile of rayon threads I bought in a junk shop when I was about 15. I have hardly used them!